I mentioned my role as a dodgy priest in Woodstock Passion Play the other day and one of this morning's moths is à propos. Cast members recently got an email about props in which one of the more learned thesps offered a crown of thorns but warned that there was a scarcity locally of 'genuinely Afroaseatic thorn bushes'. They're probably much bigger and sharper but I don't suppose that anyone will notice the difference. In the same way, the various Thorn moths in the UK can easily be muddled. But I think I am safe in saying that this one, above, is an Early Thorn, the first of three newcomers for 2014 to the trap which had a super-abundant collection to mark the last day of March. There were 94 moths altogether and here are the other fresh faces. First, the lovely little Pine Beauty, below, which provided a welcome splash of orange and pink after the days of uniform grey and dull browns. Secondly and less obviously attractive but finely patterned, were the pair of Brindled Pugs below, the first of their large and confusing tribe to arrive here this year. Micros were represented by Emmelina monodactyla, the Common Plume, below, which was one of the first moths to call by in February, and a small and tattered colleague which I think was Agonopterix heracliana. Also, for the records which I am trying to keep better now that I have more time, there were two March moths, two Caddis Flies, four Early Greys, 38 Common Quakers, 18 Clouded Drabs, 12 Smnall Quakers, 12 Hebrew Characters, one Red Chestnut and these two handsome Oak Beauties in my final picture (with an early Virginian Stock for scale). The usual gang of grey and dun-coloured brethren were joined in the trap last night by this more exotic character; one of the ichneumon wasps, I think, which we were induced to fear and loathe as children because they lay eggs in caterpillars and live cannibalism ensues. I'm seeing my little granddaughter today but she isn't old enough yet for such stories which sound awful but have an appeal to the young as the well-named Brothers Grimm well knew. The other interesting sleeper in the eggboxes was this caddis-fly-type character; the Cinammon Sedge maybe? Full IDs must await my studies later or - more likely - the kindness of my Commentors. I hope you have a lovely weekend. It's warmer again, at last. The cure for grumpiness, and especially the misleading notion that things were better in past times, is to look back. After a particularly dull catch in the trap this morning - I shall scream if I find another Clouded Drab - I flicked disconsolately to check the blog last year. I had completely forgotten. Also, my moth count for 2013 at that stage was three, plus a dead Copper Underwing found in the attic. Today the tally for 2014 stands proudly at 21. So I shall restart my day in a cheerful and optimistic mood. It rained last night so I brought the eggboxes indoors and, unusually for me because of time shortage and other demands, gently tipped the slumbering moths out on to a table. Here they are, above, all 38 of them if my numbering is correct. They are the customary bunch for this time of year: Common and Small Quakers (the latter in the picture above), Clouded Drabs, an Early Grey and one species with very different and more rakish wings than the others, this March Moth, below. But I am puzzled by the final one shown here, in three different pictures. Is it a Clouded Drab, like the one on the right in the second photo? Or a Red Chestnut? Or even (as I secretly hope) a White-marked, a moth which is not common generally but seems to enjoy living in Oxfordshire. Like Penny and me. It was the coldest night since November last night and though the sun is shining brightly now, frost remains prettily all around. Good weather, then, for the fur collars sported by the two moths below. Along with the ability of their equivalent of blood to function at very low temperatures - the Winter Moth's has similar properties to antifreeze - this helps species such as the Twin-spotted Quaker, above, and Hebrew Character, below, to function at this time of the year. Function is the word, though, rather than flourish. When I tapped the couple of dozen trap residents out of the eggbox cones into which they had crept, all played dead. I hid them - 12 Clouded Drabs, five Common Quakers, three more Hebrew Characters and two Small Quakers - in the cosiest spots I could find in the infant cow parsley and nettles and hoped that our predatory hedge birds were also making a slow start because of the cold. I've been thinking about walls this morning, because that's where last night's most interesting moths were to be found. The trap and its eggboxes provided overnight accommodation for 14 Common Quakers, five Clouded Drabs, three Hebrew Characters, two Small Quakers, one Twin-spotted Quaker and one Early Grey; but the wall of the house a few feet away had the lovely Oak Beauty above, the three Early Greys in various nooks below, and the very well-concealed Hebrew Character in the photo after that. I had myself been in Hebrew character earlier on in the evening, since I'm playing an obstreperous but rather dim priest in this year's UK must-see event, the Woodstock Passion Play. That's a diversion from moths, although our rehearsal in the Methodist chapel was given the good omen of a Small Tortoiseshell so fascinated by our antics that it awoke from hibernation - see pic bravely taken at a great distance by our friend and eggbox supplier Ali, who was called a wench by Simon o Cyrenae. There was also a small, orangey micro-moth whirring about, so I'd say that all is set fair. Two other wall thoughts, unrelated to moths. As I searched the eggboxes, I found myself humming those verses from school Latin lessons which have always made me very tolerant of graffiti because it has such a long pedigree. From Pompeii: 'I wonder O wall, that your stones do not fall, so scribbled upon by the nonsense of all.' The Romans and Greeks also had irritating youth, corrupt officials and over-enthusiastic spies, none of which are modern inventions. 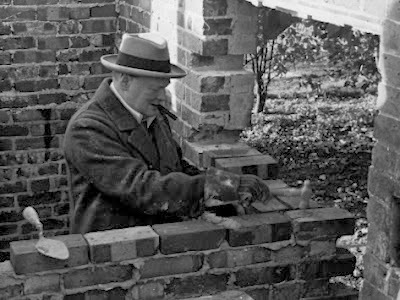 And finally, Sir Winston Churchill enjoyed building walls, which is an appealing side of his character. He also tried to reintroduce the Black-veined White butterfly to its former haunts in Kent, asking the then famous 'Butterfly man' L Hugh Newman to prepare a scheme with the characteristic instruction: 'Send me your plan and let it be a plan of action'. Alas, the experiment failed. Sir Winston builds a wall. But where are his moths? I put the trap on a scruffy bit of ground last night, amid infant cow parsley and near a hawthorn hedge which is just producing its first sprigs of 'bread and cheese'. The latter accounted for one of my first disappointments in life when my Mum used the old expression on a walk and suggested we children chew some because we were whining. We did and we didn't die, but it didn't taste like bread and cheese. The two pictures above show the star of the night above: a common moth but gloriously patterned and a lesson - used by the military in past times - in camouflage. It's a male Oak Beauty. The females prudently avoid coming to light. Also there, was a very smart Brindled Beauty, a tabby cat among moths with excellent antennae like the Oak Beauty. These are the male's prerogative in both species - appropriately because they give the moth the appearance of a Kiplingesque Indian Army major blustering about. I went back to the eggboxes in the late and very sunny morning and both moths were waking up and quite lively. Hence the antennae obligingly on show. The micro-moths are coming in now too and with the help of my Micro moth Bible plus the wondrous number of experts who live in the Upper Thames part of the UK, I am getting better at ID-ing them. But it is a challenging task. My best crack at the above - one of three in the trap - was Agonopterix heracliana, while I guessed at Diplodoma laichartingella, the fascinating Bagworm which makes beautiful chrysalis cases our of plant debris, for the one in the rather dodgy picture below. The Agonopterix is very likely to be heracliana, but A. ciliella looks very similar and is best distinguished by some subtle markings on the hindwings, or by dissection. In the UTB area A. ciliella seems to be much scarcer than A. heracliana, but that becomes a self-fulfilling prophecy if we regard everything as heracliana on the grounds that it is the commoner of the two! The second micro has prominent upturned palps, which rules out the bagworm moths and also rules out Epiblema, although I can see why you went for those. My best guess is that it is the Leek Moth, Acrolepiopsis assectella, but I can't be certain, and it is the sort of thing that I'd want to keep a specimen of if I needed a confirmed identification. When I'm asked "Why moths? ", there's often the implication or follow-up question: "Why not butterflies?" The answer is that I love them equally and have since the age of seven when I was introduced to the fascinations of both at school. A gang of us roamed the Malvern Hills under the leadership of an enthusiastic teacher called Mr Hope-Simpson (unfairly but affectionately nick-named Hopeless Sam). He very quickly taught us the essentials about British butterflies and it wasn't long before we'd seen all of the 70-odd native species that most of us are likely to see. Moths remained a more mysterious world; far greater in numbers and much harder to track down in those days (1958-63) when the thought of owning a Robinson light trap was a pipedream. Indeed, Mr and Mrs Robinson had only invented it two or three years earlier. 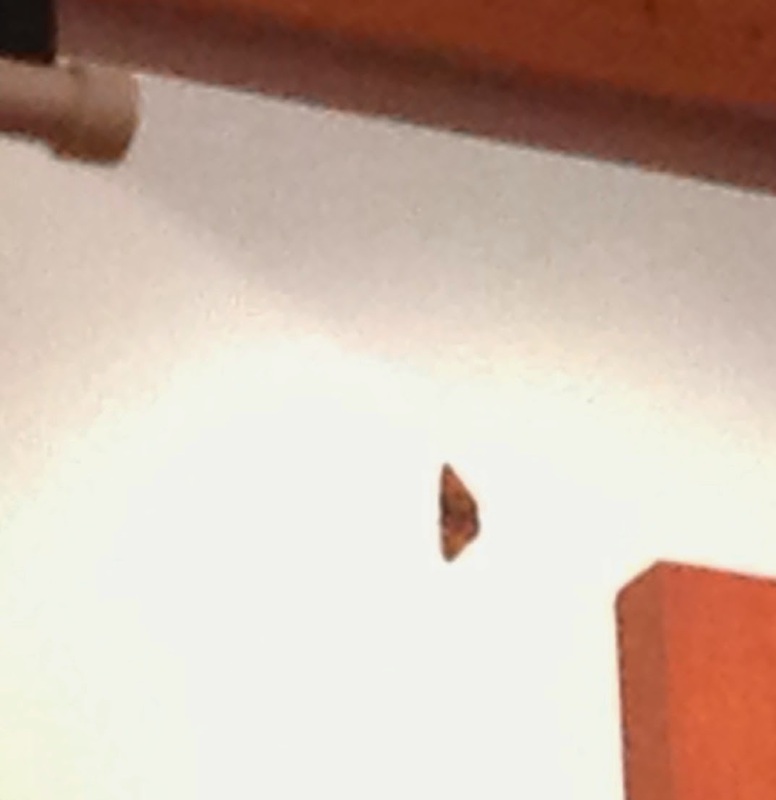 Now all is mothy joy and my lamp beams out in the dark, but I am still bowled over by the beauty of butterflies. In the sunshine of the last few days, they have been out in force here. The lemony Brimstone, rare in Leeds but common here, eluded me. None of them wanted to stop, although the blackthorn at the far end of the field up the footpath was pumping out intoxicating wafts of honey. My attempt to photograph the Small Tortoiseshells sunning themselves on the footpath were also vain; I got some but had the camera on digital macro and they came out blurred. But I got the Peacock shown at the top of this post on the blackthorn, and our local Comma which is extraordinarily territorial. It approves of only one small patch, about three yards square, of our lawn. Every time I go past with the wheelbarrow, up it flies. Can you spot the blue-eyed giant in the Peacock pic btw, hiding behind the hedge? More tomorrow from the moth trap, which hosted a very handsome new visitor last night. A diminutive visitor has paid us a lunchtime call - this Carnation Tortrix or Cacoecimorpha pronubana in posh, which was sunning itself on an inside windowpane until I opened the outside door. This let in a draught which vexed the micro-moth greatly and it buzzed off as fast as it could, which is not very fast but showed its orangey-brown hindwings to great advantage. The Carnation Tortrix only made landfall in the UK in 1905, three years after my paternal grandparents got married in Leeds. They are wearing carnations, among other flora, in our ancient photographs of the occasion (in Spencer Place at my granny's childhood home which now houses Leeds Central Mosque). The trap meanwhile continues to host a rather austere collection of Common and Small Quakers, Clouded Drabs and Hebrew Characters. Plus this, above, which I find slightly mysterious. Is it an unusually heavily patterned Twin-spotted Quaker like the one in the photograph below which was also in the eggboxes? Or an equally heavily-marked Common Quaker? Or something else? I may spend the evening with my Moth Bible now that the midwives drama on BBC TV has run its course. This post is just for the record, really, because the recent run of cold and foggy nights has reduced my moths to a trickle, for all that we've basked in lovely sunny days in between. Common Quakers and Clouded Drabs have turned up in single figures, like the elderly lady who always made it necessary for my dear late clerical uncle to officiate at Early Communion on Wednesdays because, unlike all his other parishioners, she never missed. I'm prompted to make this note only by a slight increase in numbers following a warmer night and the presence among 13 Common Quakers and seven Clouded Drabs of this particularly handsome Satellite. Do older readers remember Telstar, both the satellite itself and the excellent tune by the Tornados? I hereby name this visitor Telstar in their, and its, honour. A lesson in looking this morning - and in not getting too distracted by an interesting moth. The latter was the Pale Pinion above, a distinctive and slightly unusual species classified as 'local', which is a step up socially on the all but universal 'common'. I was so beguiled by it, and by my new practice of trying to make a correct and full audit of the eggbox inhabitants, that I nearly missed another 'first' for my tally in 2014. I was just putting things away when a curious isoceles shape on the simple but effective rainshield - above - caught my eye. Also in the eggboxes: 33 Common Quakers, 8 Hebrew Characters, 5 Clouded Drabs and 2 Small Quakers. 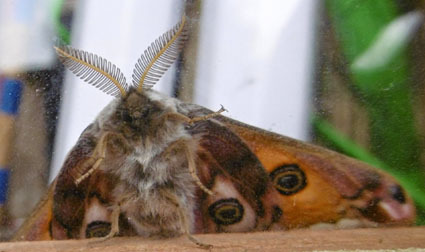 The weather has suddenly turned lovely, in the traditionally curious British way, and both the thermometer and the number of moth visitors have soared into double figures. As you can see from my first two pictures, we are back in the world of overnight residents clustering together and sometimes on top of one another; and not just in the trap. The second picture shows four Common Quakers on an unfinished window some five yards away. How many moths came to the lamp? 43 in the trap itself and another ten on the window and a nearby wall - the latter including this beautifully patterned Small Brindled Beauty - I think - below whose camouflage was just a little too dark for its surroundings. The other newcomer was my first Twin-spotted Quaker of 2014, below, and there were a couple of nice Satellites along with 31 Common Quakers, three Clouded Drabs, five Hebrew Characters, a Dotted Border and the chap at the end of this post. I had taken the precaution of finding a notebook and pen before I went out to look at the catch and I'm glad I did. I'm also glad that I ordered a spare bulb for the trap more than a year ago when my last one failed. When I turned on the lamp last night, I noticed the absence of the usual quiet hum from the choke which governs the mysteries of mercury vapour bulbs, and sure enough the bulb had gone. Here it is, in an RIP picture above, with the slightly yellowing base which I think marks its malfunctioning. I would have been sorry to have missed last night's trapping. Finally, I think this prettily coloured moth below, which completed the haul, is a Small Quaker but would be very grateful for correction or confirmation.